Mesothelioma treatment can play havoc with your digestive system. The side effects of mesothelioma treatments can include nausea, loss of appetite, diarrhea, or constipation. You may feel too tired or sick to eat much. If you don’t get enough nutrition during mesothelioma treatment, however, you can grow even more fatigued and you may start to lose muscle mass. A healthy mesothelioma diet can help you feel better and stay active. Here are 5 mesothelioma diet tips to help you strengthen your body for its fight against mesothelioma cancer. There are several reasons to get rid of sugar in your mesothelioma diet. First, sugary snacks and sodas are empty calories. They fill you up without providing the nutrition your body needs. If you aren’t able to eat as much as usual, you have even less room for foods that don’t truly feed your body. In addition, cancer cells love sugar – they take up sugars at a much higher rate than healthy cells do. Sugar helps tumors grow larger. Sweets may also repress parts of your immune system at a time when you need all your immune defenses on high alert. Fruits do not have the same negative effect as refined sugars. Try substituting a peach or an apple instead of a sugary snack. 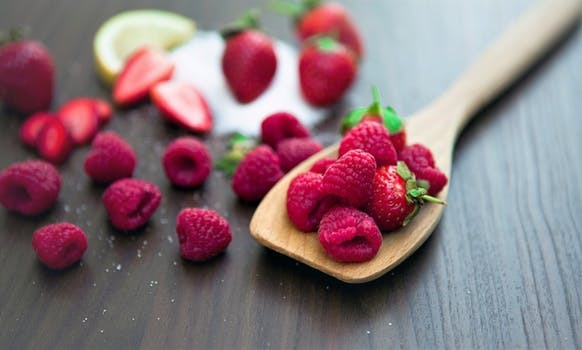 Your taste buds may need a little time to adjust, but you will soon find that a piece of fruit can be just as satisfying to your sweet tooth as candy or soda. Healthy foods that are high in protein are an important part of your mesothelioma diet. When you don’t feel like eating much, a little protein will give your body a bigger energy bump than other foods. Your body needs protein in order to replenish itself. As your immune system fights mesothelioma, protein provides extra fuel. Foods with a lot of protein can also help reduce muscle loss. In addition, it takes your body longer to process protein, so the energy you get from eating it lasts longer than energy from foods that digest quickly, such as starches. There are many foods filled with protein that can help you fight fatigue and improve your health during mesothelioma treatment. Consider adding a bit more lean chicken, beef, pork, or fish to your mesothelioma diet. Dairy products such as milk and cheese can also build you up. Eggs are a particularly rich source of health-building protein. There are many other good sources of protein, in addition to meats and dairy. Nuts, peanut butter, and beans are all high in protein and packed with nutrition. Tofu and other foods containing soy are also dense with protein. And don’t forget quinoa, which can be eaten like a carbohydrate but is actually a high-protein seed. Try some scrambled eggs for breakfast or snack on roasted chick peas. Add some sunflower seeds to your salad. Mix protein powder or almond butter into your morning shake. Try substituting quinoa in a dish where you would normally have rice. If chemotherapy or another mesothelioma treatment is making you nauseous, even drinking water may feel like more than your stomach can handle. But this is exactly when you need to keep your fluid levels up. Dehydration can add to your feeling of fatigue. By the time you feel thirsty, your bodily fluids are already depleted. This reduces the amount of blood flowing through your veins and makes your heart work harder to distribute oxygen and nutrients throughout your body. When your body is already under stress from mesothelioma, dehydration can drag you down. The older you are, the easier it is to become dehydrated, because your body doesn’t hold as much fluid in reserve. Vomiting and diarrhea often lead to dehydration. Lack of fluids can make constipation worse. If you find you are not urinating often or your urine is very dark, you may already be suffering from dehydration. Don’t wait until you’re thirsty to start drinking. It’s a good idea to keep a glass of water nearby and take frequent sips throughout the day. Water is the simplest and best way to hydrate your body, but it’s not the only way to add the liquids you need to your mesothelioma diet. Soup, tea, and juicy fruits such as watermelon will replenish you. If you are already dehydrated, a sports drink can help you get back to normal more quickly. If you were someone who liked to eat three square meals a day before your mesothelioma diagnosis, you may find you don’t have the stomach for large meals during mesothelioma treatment. That’s okay. You can still get the nutrition you need to keep your energy levels up. You just have to get a bit creative. Some mesothelioma patients find they feel better eating five or six small meals rather than three big ones. Time of day can be a factor as well. You may find that you can digest more complex foods early in the day but feel better with clear broth and tea in the evening. Experiment with different approaches. Your body is unique, so what works for someone else’s mesothelioma diet may not work for you. Whatever meal plan helps you keep your weight up and take in healthy, nutrient-packed foods is the right one for you. When you are eating for your health, it can be easy to leave taste behind. If you are feeling tired, the idea of cooking an attractive meal for yourself may be more than you can handle. But serving yourself tasty meals will encourage you to take in all the nutrients you need to fight fatigue. Ask for help with cooking from family and friends. Let them know what foods you like and what foods are in your healthy mesothelioma diet. Some mesothelioma patients find it helpful to set up a meal assistance care calendar through an online service such as Lotsa Helping Hands. Alternatively, find healthy prepared meals at your local grocery store. Many groceries and delis now offer fresh, healthy prepared food. You won’t have as much control over the ingredients, but you may find simple pre-made meals that work for you. Don’t be all or nothing. If there’s a food you loved before your illness that isn’t on your mesothelioma diet, allow yourself a guilty pleasure a few times a week. Your mesothelioma diet doesn’t mean you can’t enjoy your food.